The Tav on the Ave opened in 1988 by brothers Christopher and Patrick Person after remodeling the old Stone Toad. They offer great food and drinks in a fun, high-energy atmosphere. The Tav on the Ave is the perfect spot for a get together with friends, a private party or to catch the game on one of their many HD Tvs.The Tav on the Ave is known as the BEST SPORTS BAR in town with their ice cold beers, legendary appetizers and signature cocktails. Celebrities such as CBS SportsLine.com Senior Writer, Clark Judge, raves about the wings and how he loves a sports bar that cares about their customers! The Tav on the Ave has two party rooms available for any private party or special occasion. The porch seats 30 people and waitstaff can take orders individually from the menu or the Tav can supply party menus for a buffet style set up. The Tav's lower level seats 50 and like the porch guests can order individually from the menu or can be served buffet style. The Tav on the Ave promises to serve great food and drinks combined with a friendly and fun atmosphere. Our motto is: There's just nothing better than family and friends, and a place to get together, where good times never end. The Tav's got the reputations, and we're glad we have, the greatest combination, Tav on the Ave. Great Food. Great Drinks. Great Friends. 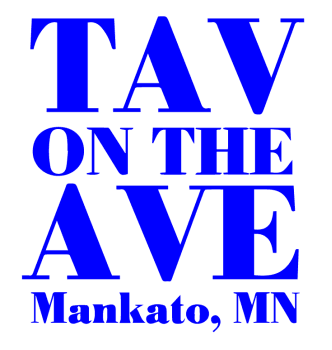 The Tav on the Ave has received an award in multiple categories each year as Mankato's Best. The Tav offers a complete menu with fresh salads, burgers, sandwiches and more. Tav on the Ave - Great Food. Great Drinks. Great Friends.